Some amazing chemistry that protects phones from water, makes impact-proof cases and enables you to fix your gadgets is emerging from the UK, but how does it work? Motorola's splash-proof Motorola Droid Razr HD and Motorola Droid Razr Maxx HD shrug off rain or getting dropped in a puddle thanks to a nanoscale coating that's applied to the phone during manufacturing. It's similar to the way Microsoft puts the VaporMg coating onto the Surface; racks of phones are put in a vacuum chamber and the air is pumped out and replaced with a plasma of fluorinated acrylates (think very high temperature chemical steam) that coats every part of the phone with between 10 and 40 nanometers of protection. UK company P2i started out treating military clothing. You can't just waterproof cloth, because sewing needles make tiny holes and the zips and seams weren't protected, and that's a problem if the liquid you're keeping out is something toxic. That means the company had to find a way of coating entire products. P2i went from weather-proofing uniforms, to hearing aids, to tablets, to phones. First it treated phones with Motorola and now with two Chinese and one European phone manufacturer that P2i chief technical officer Stephen Coulson can't yet name publicly. Splash-proof phone coatings and cases can't cope with a real downpour; the biggest problem is water getting in through the audio jack, although splash-proof coatings give your phone some protection. Currently in the labs is what Coulson calls a 'dunkable' coating that would keep your phone working even if you drop it into the bath. To demonstrate, he had a coated Samsung Galaxy S3 running in a fish tank full of water; when we saw it, it had been soaking for 1 hour 40 minutes and was still running happily. He also showed us the inside of a phone that had been treated and dropped in water, with none of the corrosion in an untreated phone after soaking. We also saw that in action on two circuit boards. When we dripped water on an untreated board, it spread out over the surface and after a few seconds we could clearly see corrosion on the components. On the treated board, however, the water formed a bead and rolled off instead of spreading out - and there was no corrosion where it had been. Nokia has been working with Cambridge University on similar hydrophobic nanoscale coatings, but P2i is protecting phones already. Another great British invention making an impact is a peculiar material that's officially called D3O Impact Material (but orange goo is just as good a name), used to protect phones in conjunction with Tech21. If you've ever mixed corn flour with a little water and then hit it with the back of the spoon and seen it turn solid and shatter, you've seen non-Newtonian chemistry in action. That's behaviour that's so odd, it doesn't follow the normal rules. Materials that turn hard and shatter on impact are called thixotropic. The molecules in D3O Impact Material are also non-Newtonian; most of the time they flow around like normal molecules, but under impact they lock together and absorb the impact, spreading the shock between all the molecules and protecting your phone. This also works for a soldier hit by a bullet (several armies use D3O in military equipment). Or as CEO Jason Roberts proved to us at CES, your hand. He grabbed a handful of D3O from the tank, wrapped it around his hand in a squidgy ring, and then hit it with a hammer. The goo went solid and he didn't end up bruised. D3O is used to make phone cases under Tech21's Impactology brand. The latest cases fit the iPhone 5 and iPad mini. You can add even more protection with the new Impact Shield screen protectors, made from another polymer which is normally used in military-grade bullet-proof glass and the cockpits of fighter jets. 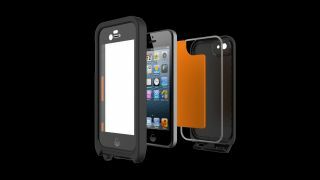 Roberts says it will protect your phone from up to a 10ft (3 metre) drop. Impact Shield looks and feels like glass rather than an unattractive layer of plastic on your phone, and you don't have to worry about getting it on without bubbles or letting it cure for 12 hours. It settles onto the screen pretty easily and again absorbs impact. It's also self healing; it's hard to scratch, but if you do get a scratch then the polymer will gradually spread back out to fill in the scratch. When it's available in spring 2013, we plan to attack it with hammers and knives to see just how much protection you get. Another nifty example of UK material science is available to buy already. Sugru is a cross between modelling clay and duct tape; it's silicon rubber you can mould in your hand that sticks to almost anything and cures in 24 hours to give you a flexible, heat-proof, waterproof seal. Developed and manufactured in Hackney, east London, it's more DIY than nanoscale coating and non-Newtonian molecules. You can use it to replace the missing foot on your laptop or to safely repair a power cable, to put a heat-proof grip on a mug, to get a comfortable custom grip on tools, mend your favourite boots - or actually make Apple earbuds comfortable. Now that is clever.